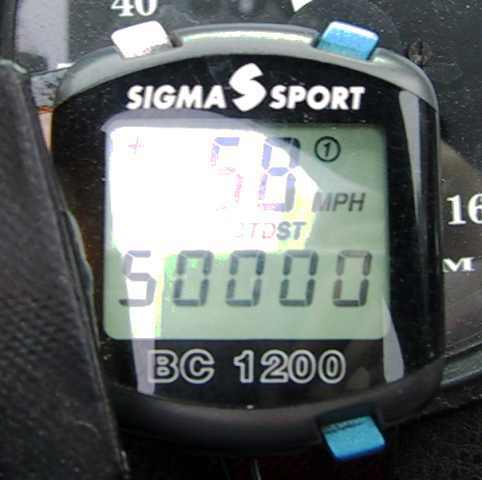 On the way to Juno to get my Freestyle dampers fitted, the odometer clicked over 50,000 miles. Steve was passenger, and captured the moment for posterity. I know there are Sevens that have done many more miles than this, but nevertheless it is pretty uncommon. The car's still soldiering on, although the repair bills seem to be coming thick and fast. I'm hoping that it will last another couple of years before it needs a chassis-up rebuild. This page is http://www.strangely.org/diary/200208/50kmiles.html. It was first published on Wednesday 28 August, 2002 and last updated on Wednesday 28 August, 2002.